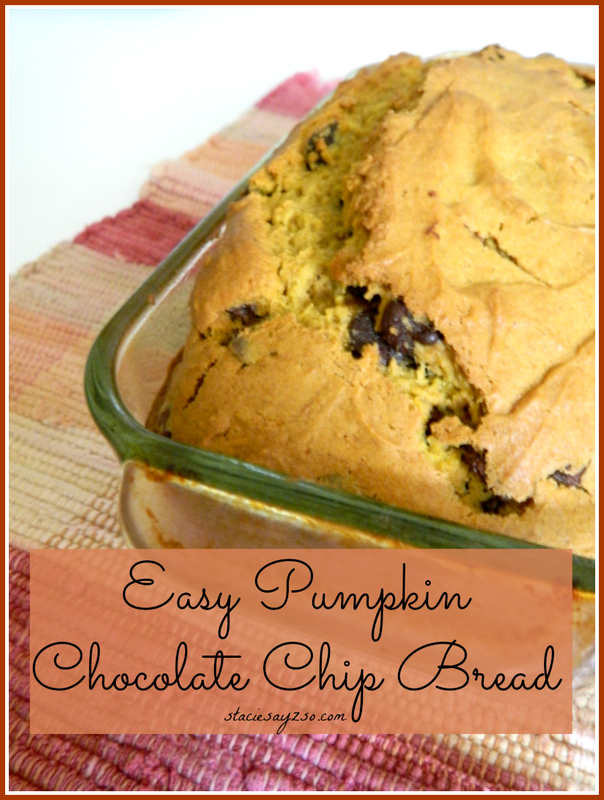 Today I'm sharing my recipe for easy Pumpkin Chocolate Chip Bread. When the weather turns colder I start baking all sorts of things. This Fall I have been having a love affair with everything pumpkin spice. As I said before, I've been buying all things Pumpkin and I couldn't wait to bake a batch of delicious, moist Pumpkin Chocolate chip bread. 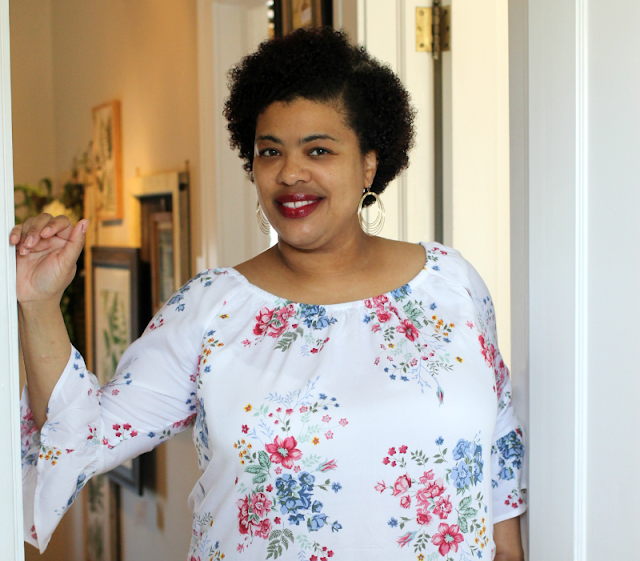 I shared this recipe years ago but wanted to update it a bit. 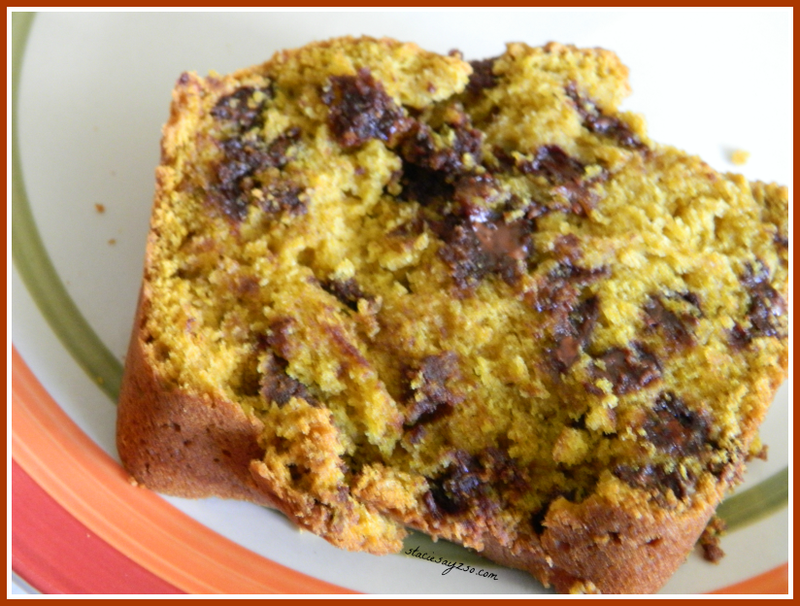 There's nothing like a warm piece of Pumpkin Chocolate Chip Bread hot right out of the oven on a cold fall or winter morning. The chocolate chips are gooey and just ooze yummy goodness. I personally think this is the best pumpkin bread recipe to make and it sure is the easiest too. *Heat oven to 350°F. Grease bottom only of 9x5-inch loaf pan with shortening or cooking spray. *In a large bowl, mix butter, granulated sugar, eggs and pumpkin with a wire whisk. Stir in flour, baking soda, cinnamon, and pumpkin pie spice. Stir in chocolate chips and walnuts. Spread in pan. *Bake 55 to 65 minutes or until the toothpick inserted in center comes out clean. Cool 10 minutes; remove from pan to cooling rack. Cool completely, about 2 hours. Do you like to bake in the fall/winter? What have you been baking lately? Aw, thanks Theresa! I will be sure to add more! OMG I am definitely trying this! Thank you! I think I have everything in my kitchen to make this bread! Which is kind of weird because I usually am missing an item or two. I must try it..maybe bring it to Thanksgiving dinner this Thursday. Thank you and I hope you have a great Thanksgiving!